Well, we recently took on the biggest nursery project to date and we lived to tell the tale. 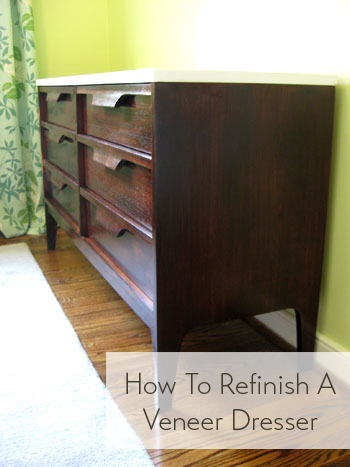 This post is a bit of a two-fer, since it not only details how to stain any wooden or veneered piece of furniture but also touches on how to paint anything that’s wood or veneer since we did a two-toned treatment on a dresser that we hunted down on the cheap. That’s right, we stained our “new” six drawer dresser with a deep rich brown tone and painted the top a crisp and glossy white color. Here’s how it all went down. The little legs along with the 54″ length was perfect, plus the clean-lined look of the dresser would work amazingly well with our crib. And did you see that price? Twenty bucks?! Yes please. I said a little prayer to the Craigslist gods and shot off an email right away. Less than three hours later we heard from the dresser’s owner and he said we were first in line if we still wanted it. 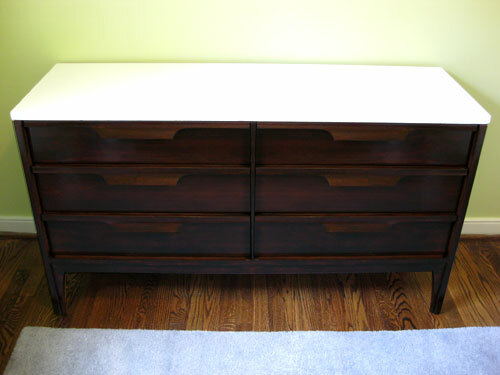 We just had two more questions: what was the depth of the piece (just to be sure it wasn’t too narrow to accommodate our 17″ changing table pad) and was the dresser made of solid wood (since that’s a lot easier to refinish than something covered in laminate or thin flaking veneer). The good news was that it was just deep enough for our changing pad. The bad news is that it was veneered (although still extremely solidly made with dovetailed joints, etc). Oh well, it was $20- what did we expect? The verdict: we said we’d love to take a look at it and again found ourselves crossing our fingers (this time in hopes that that the veneer was nice and thick so it could take some sanding and staining). See, the plan had always been to stain the dresser and paint the top a glossy white ever since we got our two toned crib and loved the look. But unlike solid wood, if veneer is too thin it’s pretty hard to sand and restain without going right through it and hitting the plywood underneath during the sanding step. Luckily when we got there to check out our new Craigslist crush the dresser had amazingly thick veneering (about 1/4th of an inch) which made it easy to determine that we could totally sand it down and restain it without any trouble. Note: to check how thick your veneer is just open a drawer or look at the back of the piece where you’ll hopefully be able to see if it’s paper thin (aka: not-sandable) or thicker than a dime or so (aka: sandable). You can see that the veneer is scraped and stained in a few areas and of course the finish isn’t deep and rich like the rest of the wood tones in our house (including the drawer on our new crib in the nursery). Hence the refinishing idea. Oh and it bears mentioning that this little staining & painting tutorial will work for any solid wood items as well as anything that’s veneered as long as the veneering isn’t paper thin. Note: this method is not recommended for any laminate furnishings because that material cannot be successfully stained since it’s not a true layer of wood. It turns out our twenty beans had scored us an original 50’s or 60’s mid-century dresser. Cool right? We thought so. And that explained why it was so well made and had such nice thick veneering (they just don’t make ’em like they used to). Anyway, the next step was to break out our trusty sander and some extra sandpaper to get to all those crevices that it couldn’t reach by hand. We used 80 grit sandpaper to rough everything up and followed that with another soft sanding with 200 grit paper just to smooth things out. Oh and be sure to always sand WITH the grain of the wood for a nice natural look (nothing screams bad refinishing job like round sander circles that soak up stain and look even more obvious when you’re done). Here’s a shot of our set-up. John got to work sanding the top, sides and front of the dresser along with the flat fronts of the drawers while I was in charge of getting into all the smaller crevices and built-in bentwood drawer pulls where the bulky electric sander couldn’t reach. We also set up a staining station for me to work on drawers on another piece of cardboard nearby (don’t worry, Mrs. Prego wore a mask to avoid inhaling anything nasty). Once things were sanded down with both 80 grit and 200 grit sandpaper (with the grain of the wood) it was time to wipe everything down with a moist rag once again, this time to remove all that sanding dust. 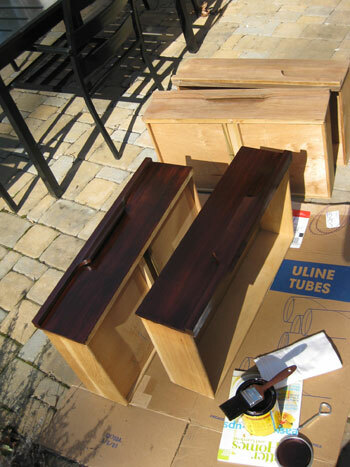 Then when things were thoroughly dry (you don’t want to stain a moist recently-wiped down drawer) it was staining time. We picked up a cheap-o synthetic 2″ angled brush (knowing that stain would likely ruin it) along with a pack of rags (which we used to wipe the stain off once we applied it) and a quart of Minwax Wood Finish stain in “Red Mahogany.” Note: we picked our stain color by taking a pretty true-looking photo of the crib drawer with our digital camera and bringing our camera with us to use as a reference while standing there in the stain aisle. This kind of stain necessitates a coat of poly on top of it to seal everything and add a nice glossy finish but we intentionally opted for it because we knew we could use our eco-friendly Safecoat poly (which is lo-VOC, no-odor and 100% non-toxic… more on that later). We could have chosen to buying a stain with a poly sealer built right in, which is unquestionably the easier approach since it doesn’t call for the extra polying step at the end, but it’s also undeniably more fume-y and chemical-y, especially for something that will live in a nursery. But it’s definitely worth noting that if you’re looking to take on a staining project and don’t mind the smellier chemicals in the poly-plus-stain-in-one option, just visit your local home improvement store to check out those “shortcut” products (also made by Minwax, although their color palette is a lot more limiting than the ones without poly worked in). We also tend to prefer liquid stain (like the one we chose above) over gel stain because we have more experience working with it, but we’ve heard that gel stain can also be amazing- especially for items that can’t be thoroughly sanded or those on a vertical plane (like wood trim) since the liquid stain can be too runny and messy. So definitely talk to the pros at your local home improvement store or do some preliminary google stain research to pick the right one for the job before you start. 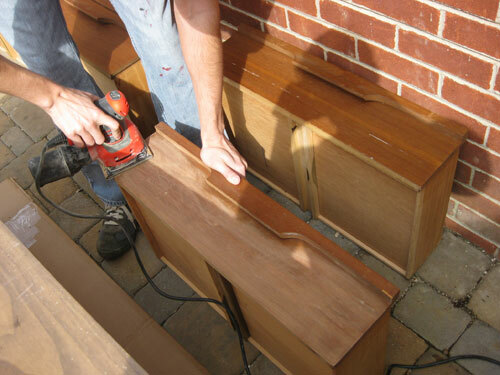 But back to the matter at hand: staining our dresser. After everything was wiped down and dried completely I just used my 2″ brush to apply one thin and even coat of stain WITH the grain of the wood on each surface that I wanted to stain (the fronts of the drawers and the sides and front of the dresser). It went on incredibly smoothly since stain is very watery and the sanded veneer happily soaked it right up. Note: if your wood or veneer isn’t soaking up the stain you probably haven’t sanded it thoroughly enough, so go back and be sure to really sand through the existing poly so the wood underneath can absorb the stain. Next we let the thin and even coat of stain sit on every surface that we applied it to for twenty full minutes. 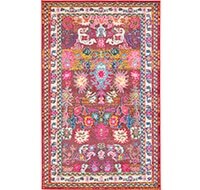 We wanted to achieve the richest and deepest absorption possible (which we reasoned would hide the most flaws and leave us with a nice saturated dark tone). 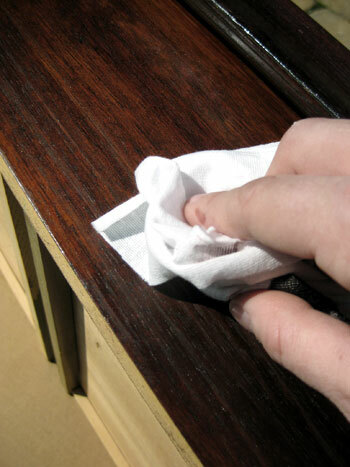 Then after those full twenty minutes we used a clean dry rag to gently rub- again in the direction of the wood- every plane of the dresser that we stained to remove the excess stain. Since we waited so long for ours to soak in we didn’t pull very much stain off at all (our rag was still dark brown but we didn’t see much of a change in tone on the dresser, for which we were extremely grateful). 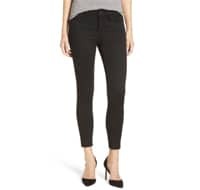 It’s important to remember that you should be gently running the rag along the surface to catch any excess stain but you shouldn’t be applying a lot of pressure (which will result in a streaky and worn down look). Slow and light is the name of the game. Presto. When you get to this step you have officially stained your item of furniture. In other words, at this point there was a victory dance in progress on our patio. 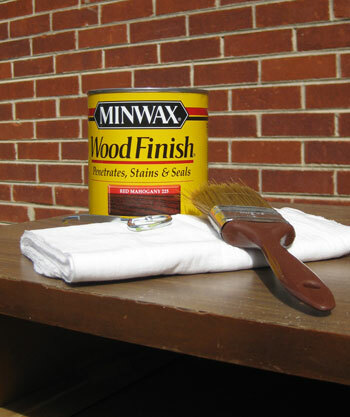 Of course there’s always the option to apply another coat of stain following the same steps outline above (brush on stain, let penetrate for a set amount of minutes, wipe away excess with clean dry rag) if you’d like a deeper or more uniform look. So if you’re left with a piece that is a bit to light or a bit too streaky for your liking we suggest going for a second coat and letting it sit at least 20 to 25 minutes to really soak things up before gently wiping it down again. Now on to how we painted the top of the dresser (we’ll get back to polying the stained portion of the piece in a moment). We had already thoroughly sanded the top of the dresser before we began staining so the next step was to apply one thin and even coat of oil-based primer to the top of the dresser with a small foam roller (while being careful not to get any on the recently stained part of the piece). It’s always smart to work out a game plan so you’re not doing a second round of sanding as an afterthought which could result in your stain getting coated with sawdust. And when it came to priming, I was able to use my foam roller to carefully apply primer without getting any on the stained area, but if you don’t have a steady hand you can hold up a rigid piece of cardboard under the lip of the top of the piece to keep primer from getting where you don’t want it. One thin and even coat of oil-based primer should do the trick. The coverage won’t look flawless but it’s there to provide tooth and some nice grip so it’s doing its job as long as everything is coated- even if it looks patchy and thin in some areas while other spots are thicker and less transparent. The reason we suggest oil-based primer over water-based formulas (or primer-&-paint-in-one products) is solely based on personal experience. We’ve attempted to paint furniture with water-based primer and have dealt with bubbling, tackiness, and terrible staining and bleed-through but have never had those problems with the oil-based stuff. Of course the oil-based formulas are stinky and harder to clean up but it’s worth it to us to do the job right the first time instead of having to do everything over again when something bubbles or bleeds through your water-based coat of primer (which you often don’t see until after your last coat of paint dries- talk about annoying!). And obviously taking precautions like applying the primer in a well ventilated area (we prefer being outside) and even wearing a mask while you work is always recommended. Really, it’s nasty stuff so you want to get ‘er done but be as safe as possible while you’re at it. The next step was applying three thin and even coats of semi-gloss latex paint with a second small foam roller (remember you can use latex paint over oil-based primer without issue, you just can’t use latex paint over oil-based PAINT since it’ll bubble and separate). We were sure to apply the paint extremely thinly and evenly and not to roll too quickly (which can rile up the paint and cause air bubbles). 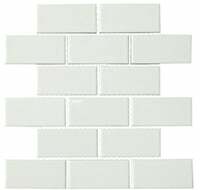 The white paint that we used is Freshaire’s off-the-rack white semi-gloss paint from Home Depot which is also what we use for all of the trim in our house and many other furniture projects. 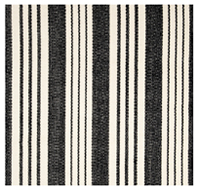 We love that it’s no-VOC and extremely comparable when it comes to the quality and coverage of other less-eco brands. Then we just let everything dry for 48 hours (we brought the dresser into the sunroom in case of rain, but kept all the screen doors open for some nice ventilation so the stain and paint were both sure to cure up nice and solidly). After two full days it was time to coat everything (both the painted top of the dresser and the stained base of the piece) with a nice protective, glossy and totally wipe-able top coat of Safecoat Acrylacq. Of course you can use a cheap and easy to find quart of basic water based polyurethane instead (sold in the same aisle as the Minwax stain) but if you’re not familiar with Safecoat it’s definitely worth checking out. 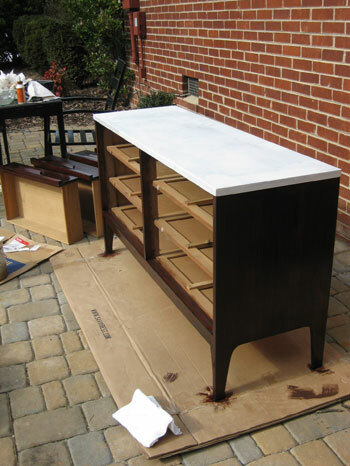 We actually first used it here when we made a bathroom vanity from a night table, and we had most of the quart leftover so we happily used it to seal all that stain and primer/paint for a non-toxic, odor free finished product. Note: we found it at a local green boutique called Ecologic but you might want to google around or even check out greendepot.com to see if you can hunt any down for yourself. We just applied two thin and even coats of the stuff with a brush (giving it ample drying time in between coats- about five hours or so- to avoid any tackiness or drag marks). You should not get brush strokes if you apply this (or any other water-based poly) very thinly- about as thin as an eggshell or a piece of paper. And you definitely want to brush it on WITH the grain of the wood and gently brush out any bubbles that you see (bubbles can dry and remain forever). The only way you’ll end up with a marred finish or unsightly brush stokes would be if you apply it too thickly or don’t allow an area to thoroughly dry before touching it up again. So gently brush out bubbles as you go and apply very thin even coats, then wait to do a second coat and resist the urge to go over areas that you already did a minute or two before to “clean them up” (because you’ll do more harm than good). We gave everything three full days to completely cure in our well-ventilated sunroom so by the time we brought the dresser into our nursery over 72 hours later everything was nice and solid so we didn’t have to worry about getting rings on the tabletop if we placed an object on it. Plus everything was 100% odor free and non-toxic thanks to those last coats of Safecoat, so it was nice to walk into the nursery and visit the dresser without smelling it from a mile away. 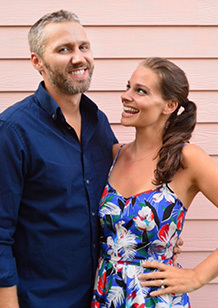 You know how we like to visit our recent projects (we hung out in our recently renovated bathroom for weeks after we finished that big makeover). Isn’t the two-tone finish fun? We think it ties in perfectly with our crib, and it sort of has a kitchen island effect (it’s reminiscent of rich dark cabinets with a glossy white countertop). Plus we love that the entire piece is super protected and wipe-able thanks to the Safecoat, so whether the beanette decides to have a digestive explosion while we change her or throw a wood block at the dresser in a fit of rage, we’re pretty sure it’s up for the challenge. 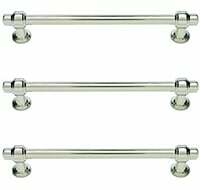 We also love the hardware-free handles since they’re unusual and interesting- and the fact that we get six spacious drawers for storing everything from clothes and diapers to books and toys is really the icing on the cake. 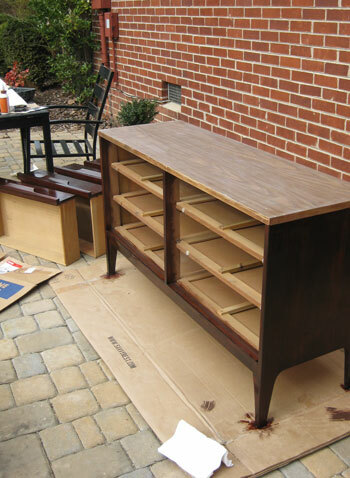 And while we’re on the subject of staining and painting furniture, have you guys taken on any big makeovers of your own? We’d love to hear what you’ve been up to. 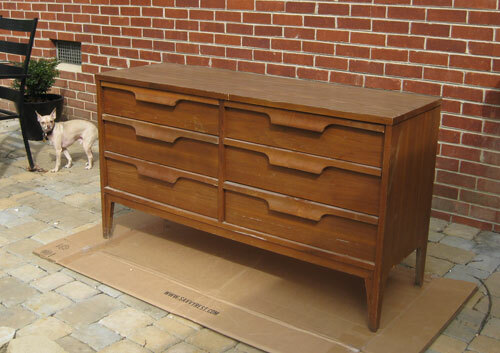 And since we also owe this dresser makeover to Craigslist for supplying this beauty (we still can’t believe it’s an original 50’s or 60’s dresser) feel free to tell us all about any and all recent Craigslist finds that you guys have snagged. Fun, fun, fun. Psst: Wanna see our nursery progress from the very beginning? Here’s our painting post, our big shopping spree, our crib hunting rundown, our curtain-making tutorial, and our fun little chair search, our mirror-painting extravaganza, and our DIY faux sheepskin project. Update: We finally created this Shop Our House page to help you hunt down any furniture/accessories that you see in our house, along with all of our paint colors. Wow, you guys did an amazing job!!! Wow! That looks fabulous! Not being a mid-century modern fan (heck, I lived through those times), I didn’t think I would like it, but it is gorgeous. Great job seeing the potential and actually achieving it. Vow!! I love what you have done with the nursery dresser. Great finish and truly unique piece. You guys are amazing. The dresser looks ABSOLUTELY FABULOUS!!!! Great job!!! Don’t you usually suggest using a brush for painting furniture? Why did you opt to use a foam roller in this case? Good question! In the past we have always opted for a high quality 2″ angled brush since that’s what the experts usually recommend, but when a handful of readers had luck with small foam rollers we decided to take ’em for a spin. The reason experts usually advise against them is because if you roll too quickly you can rile up the paint and cause little stippling and bubbles, so we rolled nice and slow and it worked like a charm. We’re always up for trying alternate methods and reporting back if they work (or don’t work) and in this case we’re happy to say that it was a success. Whew. I feel silly even asking this, but is there an easy way to tell which way the grain goes in a piece of wood? This is something that I’ve always wondered about! Sure thing, just follow the lines (aka: sand WITH them). If you don’t see any grain at all, it’s usually safe to guess that sanding from left to right on the top and the front of the piece (and top to bottom on the sides) would most likely be going with the grain. Check out our pics of the finished piece to see the obvious vertical lines on the side, which clearly indicate the direction of the wood. Hope it helps! Nice work! I can’t wait til all the snow melts and the sun comes out so we can get to work on some projects like this outside….so fun and rewarding. Looks awesome! Thanks! 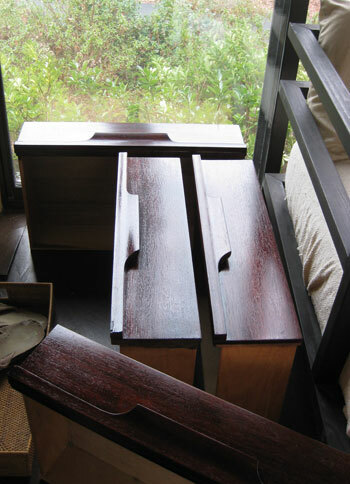 Also, what’s the best way to tell if a piece of furniture is solid wood, veneer or laminate? By the way, the dresser (and the whole nursery) looks so beautiful and classy. Good question! If you open a drawer or look at the back of a piece and the drawer front and table top look like one solid piece of wood (not like a thin strip of wood applied on top of plywood) then you’re most likely dealing with solid wood. Meanwhile if you see that telltale strip of wood (usually around the thickness of a dime or a quarter) which appears to be adhered to plywood or fiberboard you’ve probably got veneer on your hands (which is real wood, it’s just a thinner version of a solid piece). If the piece feels almost plastic-y and the grain looks a bit less convincing or isn’t there at all, you’re probably dealing with laminate (tip: tons of Ikea furniture is laminate, so it’s colored like light or dark wood but there’s no real wood grain and it couldn’t be sanded down since it’s an alternate material to wood). Hope it helps! Very nice! We recently repurposed a solid wood entertainment center that was in our master bedroom by turning it into a wardrobe for our nursery (which also has a tiny closet). We added a shelf and a closet bar that we stained with Minwax poly shades in natural cherry to match the rest of the piece. The directions on the can didn’t mention the step about wiping the stain off with a clean rag. Was that specific to the type of stain that you guys used, or is that a tip you picked up along the way? 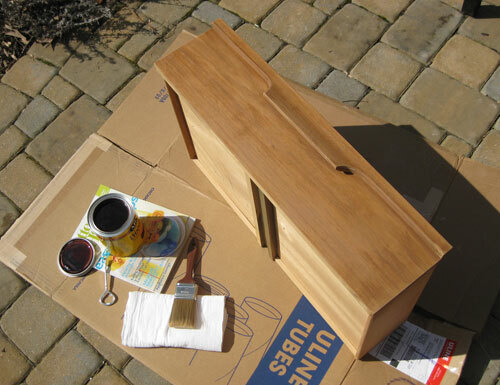 Our can actually had “wipe with a clean dry rag” instructions on the back so we followed them to a T. We used a quart of Minwax Wood Finish stain in “Red Mahogany” – just check out the post for an actual photo of the can. Hope it helps! You faked me out. I was thinking you would be painting the complete dresser white and the top dark brown. Sneaky! Do you think you will be painting the dresser again sometime down the road as the color palette may change? Yes, it’s a bit early to tell, but you never know. I am always changing colors in our home just to find the right one! Also, good idea not to buy a changing table and rather use the top of a dresser. Saves space and money! 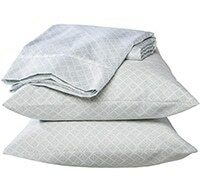 Did you get a changing pad yet? If so, where did you snag that from? We’re thinking that we’ll definitely live with the dresser without repainting it another color for a while since it works with the palette of our entire house (we have white and dark wood furnishings in nearly every room). Even if it stays in the nursery we think it can really go with any accent colors so as Baby P grows we’ll still be able to easily integrate it with whatever alternate color scheme we come up with since we chose such classic tones. As for the changing table pad, we haven’t snagged one yet but we’ve seen them at every major chain like Babies R Us and Buy Buy Baby. They even have organic ones which of course excite us to no end! It looks amazing. You guys did a great job! I have some mid century chairs to refinish that I found at Goodwill – I’m not feeling motivated to work on them. I’m so glad you had to tackle this project. I’m doing the same thing after we move in a few months. Everyone kept telling me there was no way I should sand a veneer, but you guys are proof that it worked! That’s for the post, I’ll definitely bookmark it as a reference! Looks great! Oh I love this! I have a dresser, armoire, and nightstand set that belonged to my grandparents; it’s wonderful quality but the finish, especially the top, is showing some wear and tear. I’ve wanted to refinish the tops in white but I wasn’t sure how it would look. After seeing your results, I’m definitely going to do the same with mine. 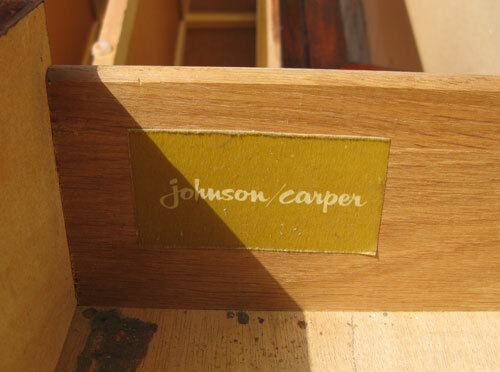 I love refinishing furniture, mid-century modern furniture is even better! I love the white top too. You did a gorgeous job on that dresser! I love it. 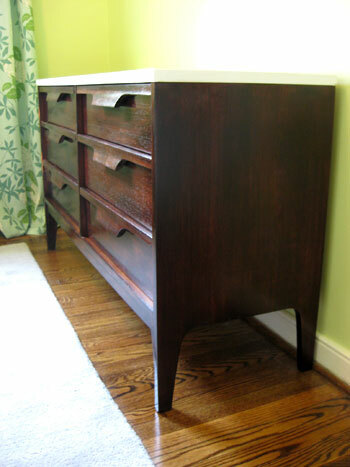 I, too, used a regular dresser for our changing table, and it worked great, since we could use it for years after the need for a changing table were over. At first glance I wasn’t feeling the two-tone, but it then grew on me…it looks great! My question was going to be if you lined the drawers…and sure enough, right before the post ended you mentioned it would be in another post…Can’t wait to see what you’ve done! I’ve got a few things I want to refinish (dresser, trunk, mirror) just waiting for the weather forecast to be nice enough several days in a row….darn elements! 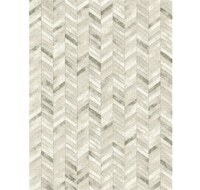 So I do have a question for you…have you ever stained over metal? Is it even possible? My mother recently gave me a trunk to use as a coffee table. It is wooden and framed in metal, I think maybe steel. I want to stain the entire thing and then poly coat it and line the inside with a unexpected fun colorful fabric. Do you think it’s possible to stain the metal? Thanks in advance! Again…can’t wait for the drawer liner post! You should be able to sand or use a chemical stripper on metal so if it was painted and you wanted to get rid of that color and start over that would be a good way to go. We don’t think you’d have much success staining metal though, since it’s not absorptive like wood so it would just look like smeared brown goo or tar. Your best bet would be to paint it a rich wood-like tone (which will go on a lot more evenly) and then you can line the inside with some fun colorful fabric. Hope it helps! My question is.. didn’t you freeze your tooshie off doing this project outside?? I’m assuming you did this recently? But then again I guess babies don’t exactly wait around for warmer weather to arrive ?. The cold has been keeping me from doing many projects I want to tackle- I have to work up the nerve to even enter my garage! The dresser looks awesome btw! 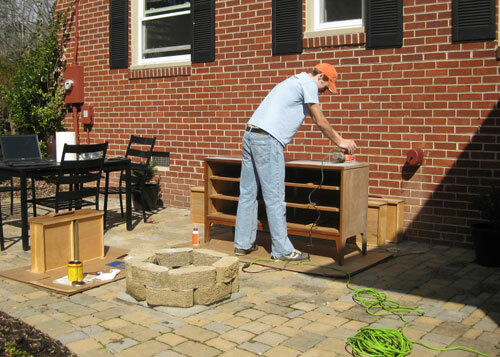 We actually completed the sanding/staining/priming/painting portion of the redo outside two weekends ago on a particularly warm Sunday afternoon (it happened to be in the 60’s that day, especially when the sun was shining). I’m definitely no good at being cold so we’re thankful for the brief warm spell (this weekend was much colder so we’re lucky that we tackled it last weekend instead). You guys did a fantastic job! I love the dresser in the room and I can’t wait for the big reveal. The dresser looks great! I can’t wait until the snow melts and it gets warmer so I can do some painting…hurry up Spring! You guys have the best luck. I would never be able to find something like that for $20. Great job! This looks so beautiful!! Great job and awesome find!!! Wow, looks amazing. You give me hope that I can do something like this too!! The craiglist find will be the hardest thing, I can’t find anything on craigslist on the cheap in this area. Maybe I’ll be running around to yard sales in the spring! Holy wow, I just love the look of that dresser, and how you updated it! Awesome craigslist find! Wow, you guys did a great job! I love how the stain turned out. The dresser looks awesome! Looks like something very expensive out of the Crate and Barrel catalog! great find! thanks for posting this because I was thinking about doing the same thing. Unfortunately, haven’t come across anything yet on our local Craigslist that I fancy. And since our baby room is only 88 sq feet, I’m trying to find something that will fit in the closet, or I may look for a closet organizer. Any suggestions for closet organizers? Love, love, love his makeover! You guys really scored with that dresser. And the two- tone is such a great touch. I just keep looking at it over and over again! Wow, what a great Craigslist find! You guys are so blessed. And great revamping job! This is extra nosey so I feel kinda bad asking (apparently not bad enough not to ask, though) but will you guys give us a little layout of your nursery floorplan? I know you’ve said your room is pretty small so I’m assuming it doesn’t matter if say the chair is next to the dresser or crib (for example), but I’m just curious if you thought (or if you felt it was important to consider) about flow or the natural lighting, etc. Mad kudos on the dresser! You two must be the luckiest craigslist surfers ever! And I have to say, the first pic of the dresser on your back patio with Burger looking at it like “Oh dear, mom and dad are at it again!” is priceless. Lucky you! 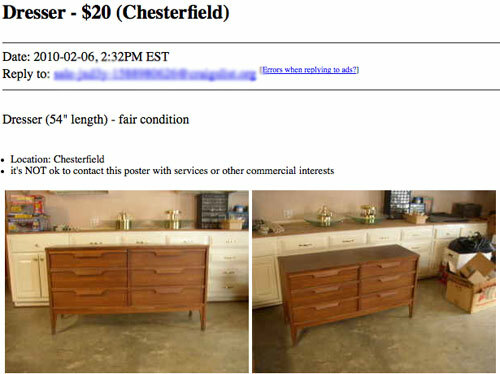 I’ve given up on our Craigslist here – you can only find a $20 piece of junk, and anything solid is (ugly and would require lots of work) $200+. I decided I didn’t want another painting project (was looking for a white upright dresser), so I actually bought the IKEA Hemnes dresser just yesterday. I really wanted something better quality, but this’ll work, and since I’m due next month, I’ll feel better finally getting all our baby clothes organized! Congrats on the dresser; it looks great, of course! Love it! Looks like you bought it that way. Great colors. You might want to talk to the experts in the paint department at your local home improvement center but we think your best bet for painting laminate would be oil-based primer followed by a few coats of latex paint (just like we did on the top of the dresser). Then you could seal it as an added layer of protection but it bears noting that laminate can’t “grab” paint and primer like solid wood or veneer (whether it’s sanded or not) so you may have a piece that looks great for a few years but it probably won’t be a decades-old look that lasts. It’s a great idea for tiding yourself over until you save up the money to upgrade though. Hope it helps! 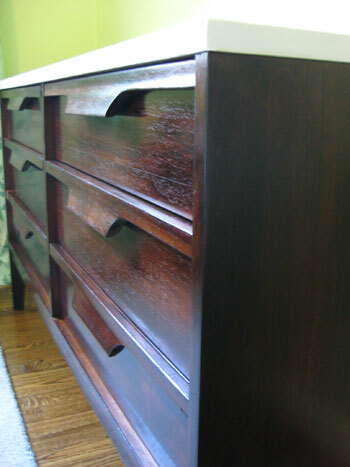 I loved the lines of the dresser when I first saw it, but I’m even more in love after your refinishing job!!! I”m also jealous of your Craigslist find – I always get too impatient going through all the listings, and I’ve never found THAT awesome of a deal! Great job! This turned out so beautiful! I’m really impressed. It turned out completely gorgeous!!! Wow, it looks like a million bucks. I love the color of the stain and the white top. This leads me to a question – I have a Pottery Barn Rhys tv stand that my adorable son has left many teeth marks on and I’m wondering at some point in the future (after we are done having kids) if I could sand and re-stain to get it back to it’s pre-baby glory? It makes me nervous to do something like that with a piece that we paid an arm and a leg for (of course before I learend about Goodwill and refinishing from you!) so I’m wondering if sanding and re-staining is something you would recommend to restore a piece like that? Thanks! Keep up the great work. Oh yeah for sure. It’s probably solid wood so it should be even easier than veneer since you don’t have to worry about sanding too deeply. Definitely go for it! You’ll be surprised how do-able it really is. Good luck! Wow! Incredible. 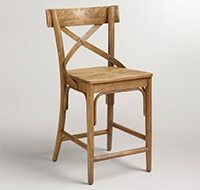 I love the style of the furniture, and you made staining it look so easy. Best project yet. Nicely done. The dresser looks great! Glad to hear the Safecoat poly worked well. I’m about to refinish our pine doors, and I wanted to use the Minwax stain, but didn’t want all the VOCs off gassing in the house. 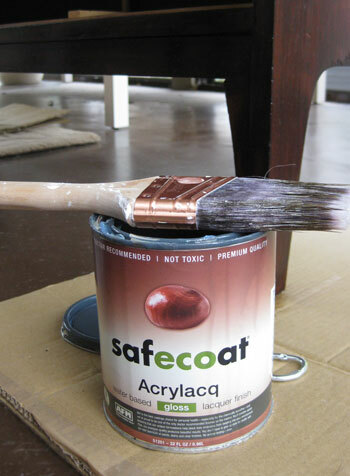 Do you think the Safecoat hardwax oil finish would also seal the nasty stuff in? I don’t want a shiny finish on the doors, and we already have some of the hardwax oil for our upcoming floor refinishing project. We actually don’t have experience with the Safecoat hardwax oil but perhaps you can call their company or search their site for that info? You also might be able to ask if they have a more matte liquid option that isn’t as glossy in case hardened liquid is more of a protective off-gassing barrier than hardwax oil. Hope it helps! W.O.W.!!!!!! That is the prettiest $30 dresser I’ve ever seen! It looks so good, I love it!! I didn’t think I would like the lack of hardware, but now I think it’s my favorite part. It really has a clean look. Great job you guys!